Strikes and protests are still raging across Iran and show no sign of abating as workers continue to express their dissatisfaction with labor conditions and the ever-worsening economic crisis in the country. Update (7:30 AM Thursday, November 29th): On Thursday morning, MEK sources inside Iran reported that security forces raided the home of Ali Nejati, one of the striking workers from the Haft Tappeh sugar mill. Nejati was arrested, and when his family asked to see the arrest warrant, they were beaten by police. Ali Nejati, former head of the Haft Tapeh Sugarcane Mill Workers Syndicate, was arrested by security forces early this morning & transferred to an unknown location. 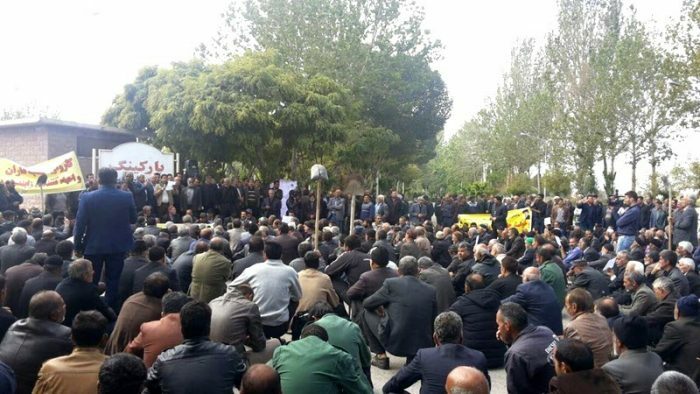 Thursday was the 25th consecutive day of strikes for the factory workers at the Haft Tappeh Sugar mill in Shush. The workers are striking in protest of months of unpaid wages and the privatization of the company. The workers published a list of their demands on their Telegram channel and in a written statement. Their demands include basic labor rights such as regular payment of salaries, employer payment of insurance fees, job security for contract workers, and provision of work tools and materials. Most of the workers’ demands are already guaranteed under the Iranian regime’s labor laws, but these laws are not being enforced. For example, Iranian labor law dictates that employers are responsible for providing transportation or compensation for transportation for their employees’ commute to and from work. Haft Tappeh has ignored this regulation altogether. Employers are also required by law to provide one hot meal per shift. This law has also been disregarded by Haft Tappeh’s owners. Haft Tapeh sugar cane mill employees rallying for the 26th day, demanding delayed paychecks & protesting corrupt practices by the company's private owners. The regime has responded to the workers’ demands by sending suppressive forces to arrest the striking workers and by dispatching the head of the regime’s judiciary to threaten the strikers and accuse them of sedition. 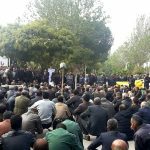 The Haft Tappeh factory workers have also asked for the release of their colleague, Esmail Bakhshi, as part of their demands. Bakhshi is a spokesperson for the protesters who was arrested with several others as part of a crackdown by suppressive forces last week. After the striking workers and a growing number of supporters rallied for their release, the regime relented and released the other jailed protesters, but Bakhshi remains in custody. The farmers of Isfahan are entering their third consecutive month of protests over the lack of access to water, which has wreaked havoc on agriculture in the province. Agriculture is the primary source on income in Isfahan, so virtually everyone in the region has been affected by the scarcity of water due to the drying of the Zayanderud River. Isfahan’s farmers blame the water crisis on the regime’s corruption and mismanagement of the country’s water resources. Over the past two decades, the regime has diverted the Zayanderud River, which supplies water to the Isfahan region, to its factories upstream of Isfahan, leaving the once-prosperous farmers without water to irrigate their crops. This, combined with droughts, has left the farmers without a source of income. The Isfahan farmers have protested by blocking streets with their tractors and machinery and camping in intersections of cities and towns. Also on November 25th, farmers in Qarnah staged a sit-in at the Qarnah mosque. State security forces attacked the protesters there and broke the mosque’s windows in the process. The water crisis has reached such epic proportions that regime has been forced to acknowledge it, at least in part. Hasan Kamran, a member of the regime’s parliament who represents Isfahan, admitted that the Ministry of Energy has given 1,592 million cubic meters of water to Isfahan Steel, Iron and Steel and military industries, leaving the people of Isfahan to survive on wastewater. “The law of water right goes back to 1964, and the Ministry of Energy had no legal right to change it and sell the water,” he said in an October 21st interview with a state-run media outlet. Nasser Mousavi Largani, another member of the regime’s parliament, described the current agricultural conditions of Isfahan’s farmers in dire terms. “The farmers of Ghahderijan – their land has turned into desert. They do not have bread to eat. Likewise, the farmers of Pirbakon,” he said. the number of dairy cattle has dwindled from 50-60 thousand to less than 30 thousand. “Livestock is really disappearing … 70-80% of poultry farms in the region are not used,” said Bakhtiar. The MEK salutes Isfahan’s striking farmers and calls upon all Iranians, particularly the youth, to join in solidarity with their protests and to support them in their demands for water rights.